Earlier when I was survived from miserable accident, I didn’t believe or thought that something like this could ever happen with me again. 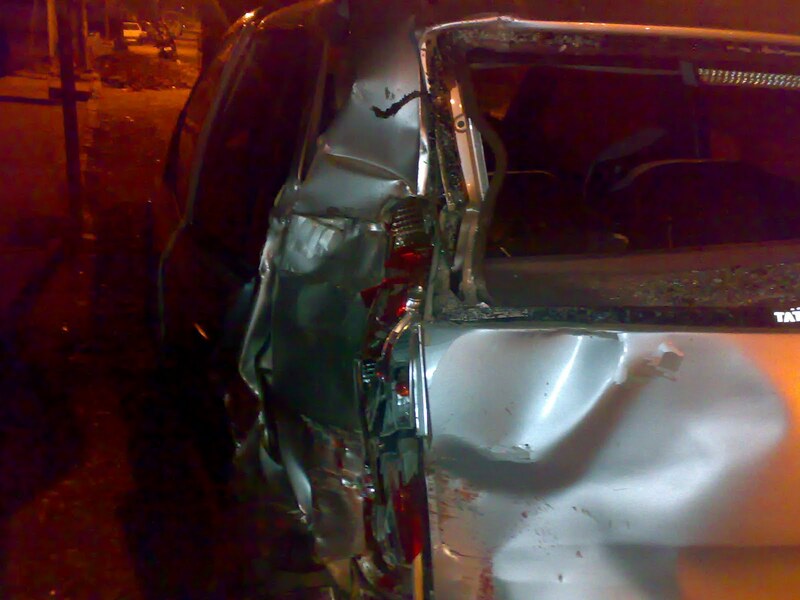 But it happened again and within a time span of one year on 26 March 2010. Me and Hiren were coming back from a client meeting from Kandivali. It was too late to return from a client meeting. Almost 11:30 when we left from Raghuleela mall for our way back to home. We were discussing on how was the meeting and what was the outcome. We reached near one of the flyovers and gave a left signal, still discussing on how was the meeting. Speed of the car was deliberately made slow so that we can go to left and do not use flyover. Suddenly I heard a strong sound of glass breaking. Before I could understand anything, I saw blood coming out of my forehead…. I was not able to understand what happened. There was a bleeding from my head as well. I checked for Hiren near me, but could not see him. I tried to open the door of my side, could not do it. Was still in dilemma on what had happened and I shouted for Hiren. He came rushing in founding me bleeding from various places. He even tried to open the door at my end but could not. He again went out of car and pulled the door to open it successfully and I went out rushing. 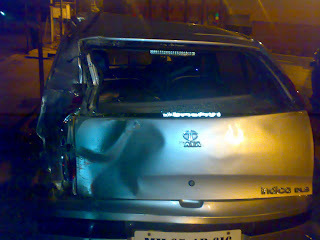 People were gathered around the car and I found the car had been thrashed from behind by a truck. I immediately put my hand on my heart (I keep the “MALA” given by Pujya there in pocket) and got some strength from there. I sat down on the footpath nearby keeping my handkerchief on my head to stop the blood. People gave me tissues from the car to use it and water along with a warning me against using the water on my head as it could cause some other problems. Hiren called Ashish, his brother, and told about the accident. He was trying to find out who could be the nearest one to help us in this situations. After trying for few contacts, he was able to get in touch with his sister-in-law and her husband. They both came rushing in to help us. Thank God that they came in time to help us. She got some turmeric from nearby house and applied it on my injuries to avoid septic. That was the best thing to help in this situation. Her husband called the hospital where one of his friends is working and asked him to arrange for some first aid so that they can attend me immediately. We three then rushed to the hospital and Hiren was taking care of car and he truck driver from whom he had already taken the driving license and other truck papers to make sure he do not run away. After leaving from the police station, we took an auto to leave for Hiren’s home. The way was the same and we reached accident site where Ashish and Mandar were waiting for someone to come and tow the car. This was the first time I saw the condition of the car. Man, it was so damaged from the behind that it made me think, HOW DID WE SURVIVE from this miserable accident. We reached his home and took some rest. I again updated home that we have reached here and I shall return home till noon. After few hours, I left for home along with Hiren’s mother and father in a cab. After reaching, before going to home, I went to our family doc where he suggested for a city scan to make sure nothing is wrong with my brain (;) wink). At home everyone were waiting for me and happy to see me all right. My father was out and when he came back, he didn’t say anything and just sat in front of me. My God, he was crying. I saw him crying for the first time and that was because of me, I was so hurt that I made him cry but nothing was in my hand though. Well, I convinced him that there is nothing wrong with me and everything is all right. In the evening, we went for city scan and in the report, it was fracture in my eye brow bones. Never heard something like this can also happen. On visiting the orthopedic surgeon, he said nothing can be done here, the bed rest and medicine will only help to heal this. This was the whole story… whenever I think of that day, naah that night, a shiver passes from my whole body. Thank you God for helping us to survive and I could say, this is my second life what I am living after accident. Below is the snap of the car. A man opened his wife's closet of clothes. It was lined with sarees that she had worn just once, may be twice. There were others that had been kept away unused, waiting for a special occasion. He opened her jewelry box. It was neatly packed with necklaces and earrings that had not been worn for so long that he had even forgotten that she had them. There were rings and bracelets that she had cherished with care. There were old bangles that his mother had given to her. They too, lay packed in silken pouches all for a special occasion. He moved to the crockery closet in their dinning room. Rows of crystal glasses and expensive chinaware, stared at him sadly. The silver cutlery set that he had bought her still lay in its suede jacket, waiting for a special occasion. There were so many souvenirs around the house that stared gloomily at him. He looked at his beloved wife's picture hanging on the wall, garlanded with freshly strung jasmine flowers. He had performed her last rites just yesterday. She had passed away, after a prolonged and painful illness. All the things that she had bought, with so much fervour, but never got to use, hit him like arrows. He was full of regret. Why had she not worn those lovely sarees? Why had she spent her life scrimping and scraping for the tomorrow that she never woke up to? Why had they not dinned in their silver and crystal? No one is as special as you and your family. No moment or occasion is as special as NOW. There is surely a lot of sense in saving for a rainy day, but at the same time we must learn to live in the present. Live life to the fullest and don't worry about the next day, it's already tomorrow in Australia ! NEVER PROCRASTINATE Coz if you enjoy it today, You can do it again tomorrow.